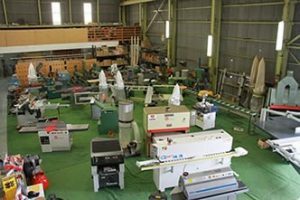 J C Walsh was established in 1959 as a power tool repair Company and in 1981 later branched into selling, refurbishing and repairing woodworking machines. The owners , Bernard & Christine Crandles purchased the business in 1976. The business is continually growing and it is pleasing to note that most of the staff have been with the company for 20 plus years. In fact our power tool mechanic, Nick, for the entire 43 years. We are the Victorian distributors for Luna Aluminium machines and a range of woodworking machines such as, Virutex and Rikon. In addition we remain agents for the Leda range of woodworking machines. In our refurbished machinery we recondition most brands such as Altendorf, SCM, Wadkin, De Walt, Paoloni, Griggio, Samach, Wolfendon, Woodfast, Vitap, Rye,Woodman and many others. workshop waiting to undergo refurbishment which is all done in house. If you don’t see it on our website give us a call as the machine you are looking for could be next in line . All of our used machines are offered for sale fully reconditioned and guaranteed and we can arrange and supply delivery Australia wide. We also have an extensive range of new and used spare parts suitable for a wide range of machines and we can despatch these parts overnight in most cases. We also offer an on site repair and maintenance service (in Victoria) which covers most standard or classic machines. Finally we pride ourselves on supporting Schools, Woodworking groups and Men’s sheds.